The Cinemalaya Independent Film Festival held annually at the Cultural Center of the Philippines has played a key role in representing & nurturing talent as well as encouraging the creation of new cinematic works with an unequivocal commitment to enduring, contemporary filmmaking. For the movement & the movers, there is also an emphasis on works ‘that boldly articulate and freely interpret the Filipino experience’ with fresh insight & artistic integrity. Standing up for culture & the world of art films, be sure to drop by Indie Sine at Robinson’s Galleria on Tuesday, November 24 for the first installation in a series of indie film screenings called Metropolis presented by community based artistic collective & grass-roots production team, Anahata Foundation. 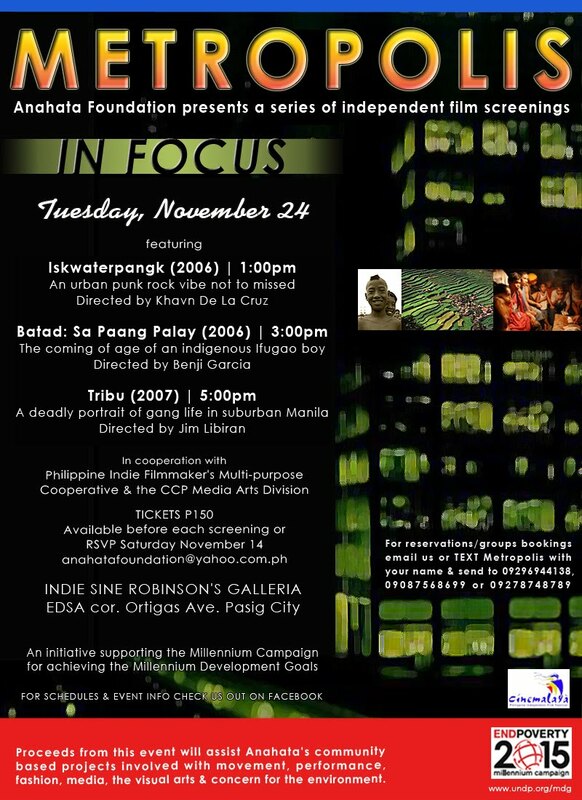 With an urban punk rock vibe ‘Iskwaterpangk’ (2006) directed by Khavn De La Cruz will play back to back with ‘Batad: Sa Paang Palay’ (2006) & 2007 Cinemalaya Best Film Awardee ‘Tribu’ as the third headliner, where in exploring tribal customs, provocative urban themes & the indescrutability of the human spirit, directors Benji Garcia & Jim Libiran together embrace an evolving pilgrimatic sensibility that might also serve as a metaphor for modern times. Following in the footsteps of the recent Wi_i Body 4 ‘In Focus’ series at the Cultural Center of the Philippines, don’t miss this bold line-up of works, well regarded in the arts scene for the social issues explored as well as for their historic & cultural significance, educational focus & entertainment value. Metropolis is made possible through the assistance of the Indie Filmmakers Cooperative (IFC), the Cultural Center of the Philippines Media Arts Division & Cinemalaya. Screening times are at 1:00 pm, 3:00 pm & 5:00pm with featured filmmakers dropping by to introduce their films & share industry insights. For reservations / inquiries please call Indie Sine (632) 395.2038. You may also text +63.929.6944138 / +63.908.7568699 / +63.927.8748789 or email: anahatafoundation@yahoo.com.ph. Indie Sine is located at Level 4 of Robinson’s Galleria along EDSA corner Ortigas Avenue, Pasig City. wow... see you there, thanks sir.